People eat and drink very differently throughout their life. Each stage has diets with specific ingredients, preparations, palates, meanings and settings. Moreover, physicians, authorities and general observers have particular views on what and how to eat according to age. All this has changed frequently during the previous two centuries. Infant feeding has for a long time attracted historical attention, but interest in the diets of youngsters, adults of various ages, and elderly people seems to have dissolved into more general food historiography. 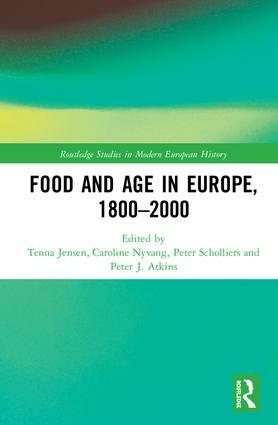 This volume puts age on the agenda of food history by focusing on the very diverse diets throughout the lifecycle. Tenna Jennsen is Associate Professor of Health and Ageing Research at CoRe-Center for Health Research in the Humanities, University of Copenhagen, Denmark. Peter Scholliers is Emeritus Professor of History at Vrije Universiteit Brussel (VUB). Peter J. Atkins is Emeritus Professor of Geography at the University of Durham, United Kingdom.